These Terms and conditions(the "Terms") are intended to define the conditions and modalities of consultation and use of campsites.seaview-france.com, referred to herein as "the Site", edited by VUE SUR MER®, referred to herein as "VUE SUR MER". Simply access or use the Site constitutes acceptance by you of these Terms, you may are a campsite manager (referred to herein as “Advertiser) or a Traveler (referred to herein as "Traveler"). 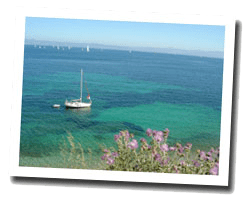 The site offers a selection of campsites with panoramic sea view or direct access to the sea along the French coastline from North to Corsica. These campsites are proposed by various Advertisers, including individual managers, holiday villages, etc. 2. This site is a portal site. We are not involved in any transaction between Travelers and Advertisers. 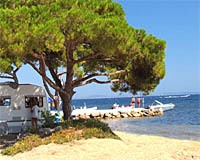 We do not own or manage any campsite listed on the Site. As a result, any part of an actual or potential transaction between a Traveler and an Advertiser are solely the responsibility of each user, including the quality, safety or legality of the campsites advertised, the truth or accuracy of the listings, damage or misuse in the campsite or the ability of Travelers to pay. We are also not responsible for the condition of the campsites listed on our Site or the compliance with laws, rules or regulations that may be applicable to any campsite in any jurisdiction. The User acknowledges that the Internet presents specific techniques that involve the inability to guarantee the absolute continuity of services, response times and security in data transmission. The User acknowledges that the Services provided will be interrupted for maintenance reasons, or cases of “force majeure” or beyond the control of VUE SUR MER ®. Responsibility for VUE SUR MER ® can not be held liable for malicious introduction or a hacking site. The responsibility of the site, its managers, directors and / or employees shall not be sought about quality or specifications of the products and services provided by Advertisers or about payment transactions made ​in the context of relations between Advertisers and Travelers, or about direct or indirect damages such as loss of customer, legal action, any disturbance to business, liability, loss of brand image, loss of profits, etc. 6. Proprietary rights and downloading of information from the Site. 7. Unauthorized Uses of the Site. We draw the attention of travelers about the risks of entering into any contract and the risks of Internet use. Each Advertiser is solely responsible for the services, benefits, and information provided, including the photo of the campsite. we are not required to verify the information provided by the Advertisers. According to case law, the responsibility of the site can not be held liable for errors or omissions in the corpus of ads. Information is to be confirmed when booking under the sole responsibility of the managers of accomodations presented. Pictures provided by each campsite. The Traveler recognizes its responsibility to verify such information before the conclusion of the contract. Consequently, the Traveler recognizes that the responsibility of VUE SUR MER ® can not be sought for the services or information offered, and accepts that their use is carried out under its sole responsibility. Some ads are provided by trading partners, including Suncamp, Campeole, Vacansoleil, Homair, Siblu (not exhaustive). These ads fall within the general conditions of each partner. This agreement shall be governed by and construed in accordance with the french laws.